Nearly all stars belong to gigantic groups known as galaxies. The Sun is one of at least 100 billion stars in our galaxy, the Milky Way. And there are billions of galaxies in the Universe. Everywhere we look in the sky there are galaxies of different shapes and sizes. Some are spirals, with curved arms wrapped around a bright central core. There are three main types of galaxies: Elliptical, Spiral, and Irregular. Two of these three types are further divided and classified into a system that is now known the tuning fork diagram. When Hubble first created this diagram, he believed that this was an evolutionary sequence as well as a classification. WHAT GALAXY OUR WE IN? Earth is located in one of the spiral arms of the Milky Way (called the Orion Arm) which lies about two-thirds of the way out from the center of the Galaxy. Here we are part of the Solar System - a group of eight planets, as well as numerous comets and asteroids and dwarf planets which orbit the Sun. The Milky Way Galaxy is organized into spiral arms of giant stars that illuminate interstellar gas and dust. The sun is in a finger called the Orion Spur. Early astronomers thought the Milky Way was a spiral galaxy much like the nearby Andromeda Galaxy. WHAT IS THE NEAREST GALAXY TO THE MILKYWAY GALAXY? At a distance of about 2.5 million light years, the Andromeda galaxy (also known as NGC 224 and M31) is the nearest galaxy to the Earth apart from smaller companion galaxies such as the Magellanic Clouds. Like the Milky Way, Andromeda is a spiral galaxy. The summer Milky Way will look brighter in the Northern Hemisphere. Most noticeably you should be able to see the Great Rift in good dark skies. This dark lane in between Cygnus and Scutum is where a string of dense interstellar clouds block the view of more distant stars. DOES THE MILKY WAY GALAXY MOVE? The Andromeda Galaxy is the most distant object you can see with your naked eyes, two million light years away. It is visible as a dim, fuzzy star from a dark sky site. With binoculars you can clearly see the elliptical shape of the galaxy. One says that galaxies were born when vast clouds of gas and dust collapsed under their own gravitational pull, allowing stars to form. The other, which has gained strength in recent years, says the young universe contained many small "lumps" of matter, which clumped together to form galaxies. Stars are not scattered randomly through space, they are gathered together into vast groups known as galaxies. The Sun belongs to a galaxy called the Milky Way. 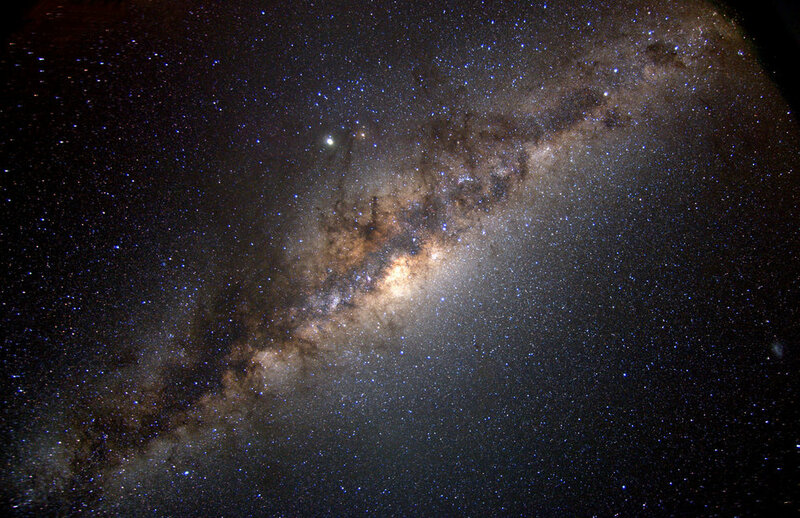 Astronomers estimate there are about 100 thousand million stars in the Milky Way alone. Outside that, there are millions upon millions of other galaxies also! HOW OLD IS THE MILKY WAY GALAXY? New estimate of the age of our Milky Way Galaxy suggests it was an original member of the universe, having been born just ab out as early on as was possible. The overall universe is about 13.7 billion years old. It includes living things, planets, stars, galaxies, dust clouds, light, and even time. ... The Universe contains billions of galaxies, each containing millions or billions of stars. The space between the stars and galaxies is largely empty. Astronomers think space might be infinite, with "stuff" (energy, galaxies, etc.) distributed pretty much the same as it is in the observable universe. If it is, that has some seriously weird implications for what lies out there. Beyond the Hubble Volume you won't just find more, different planets. WHAT IS THE UNIVERSE CONSIST OF? WHAT IS A CELESTIAL BODY? A Celestial body (astronomy, astrology) A natural object which is located outside of Earth's atmosphere, such as the Moon, the Sun, an asteroid, planet, or star. IS THERE A END TO SPACE? Whether space ever ends is a hard question. There is a limit to the space that we can see, because if there is stuff beyond 15 - 20 billion light years (the age of the Universe) the light from there hasn't reached us yet. So we don't know. This information helps astronomers determine the age of the universe. Age may only be a number, but when it comes to the age of the universe, it's a pretty important one. According to research, the universe is approximately 13.8 billion years old. WHAT SIZE ARE BLACK HOLES? Black holes can be big or small. Scientists think the smallest black holes are as small as just one atom. These black holes are very tiny but have the mass of a large mountain. Mass is the amount of matter, or "stuff," in an object. Another kind of black hole is called "stellar." Its mass can be up to 20 times more than the mass of the sun. There may be many, many stellar mass black holes in Earth's galaxy. Earth's galaxy is called the Milky Way. Scientists think the smallest black holes formed when the universe began. Stellar black holes are made when the center of a very big star falls in upon itself, or collapses. When this happens, it causes a supernova. A supernova is an exploding star that blasts part of the star into space. Scientists think supermassive black holes were made at the same time as the galaxy they are in. WILL A BLACK HOLE DESTROY EARTH? Black holes do not go around in space eating stars, moons and planets. Earth will not fall into a black hole because no black hole is close enough to the solar system for Earth to do that. Even if a black hole the same mass as the sun were to take the place of the sun, Earth still would not fall in. The black hole would have the same gravity as the sun. Earth and the other planets would orbit the black hole as they orbit the sun now. The sun will never turn into a black hole. The sun is not a big enough star to make a black hole.